Concrete or stone patios and driveways can be beautiful additions to your home’s outdoor living spaces. However, years of neglect will leave them covered under dirt, dust, mildew and moss. Just like most other maintenance for your home, these areas should be regularly cleaned. Homeowners who continue to disregard these areas will eventually find themselves unable to enjoy their patio as it was originally intended. Exterior Cleaning Services is one of Lafayette’s leading driveway cleaning companies and the effectiveness of our Driveway cleaning service is widely acknowledged as being second to none. Our range of services for cleaning driveways can deep clean and restore any driveway surface using a revolutionary industrial rotary power washing system, effective enough to remove unsightly marks and most oil stains. Today’s home improvement centers promote “do-it-yourself” solutions for these problems, but it can actually cost more when one adds up all the time and materials needed to do the job correctly. It takes experience to know how to properly operate a pressure washer, what nozzles to use, and how to clean without causing damage to the surface area. Also, cleaning it in a manner that results in a neat and uniform appearance involves skill and can leave an inexperienced homeowner frustrated. 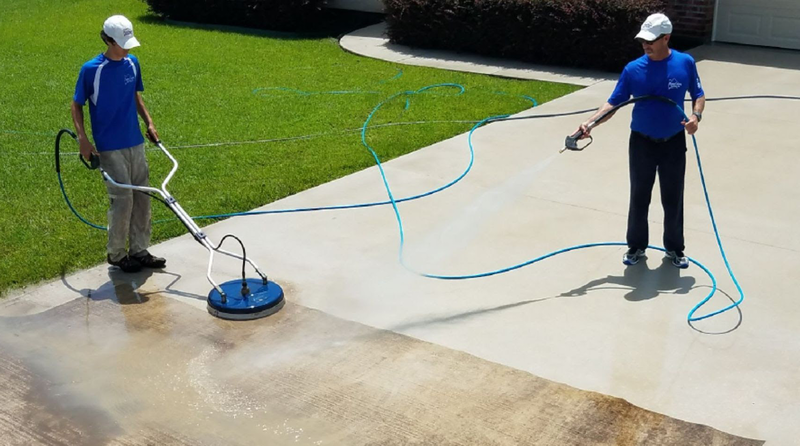 Exterior Cleaning Servcies covers Lafayette, Acadiana, and all surrounding areas for both commercial pressure washing and residential pressure washing services. Exterior Cleaning Servcies is fully insured and customer satisfaction is our overall mission.